Keeping You & Bears Safe - Wild With Gabriel! Black Bear Country: Keeping You and the Bears Safe! Here are a few things to remember when living in or visiting Black Bear Country. Click on the "+" sign next to each talking point to learn how you can keep you and the bears safe! 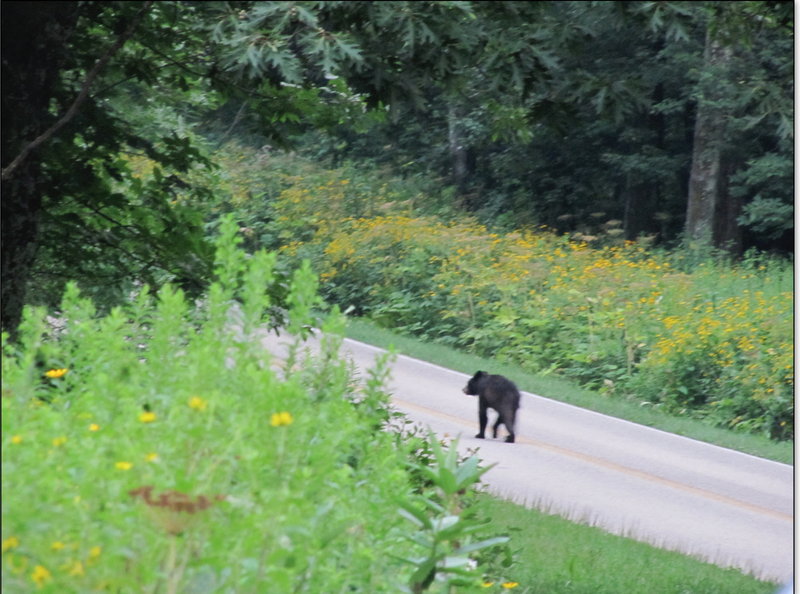 I often see bears along the side of the road. Sometimes they are feeding and other times they are crossing from one side to the other. If you live in bear territory, remember that bears are more active at dusk and dawn, so be aware as you drive through their habitat. Many Black Bears are killed every year by speeding vehicles. Driving fast in Black Bear country is not only a concern for your safety but a concern for the safety of bears and other wildlife! Do not feed bears or any other wildlife! This is the cardinal rule of behavior in bear country. Even if you see an emaciated bear and think you are “helping it out,” it will then associate humans with food and possibly be named a “nuisance bear” by wildlife officers in which case it will have to be relocated or put down. Feeding bears also makes them lose their fear of humans and become easier targets for speeders and poachers. Do not leave your food unattended in bear country, even for a moment! Countless times each year I walk through a picnic area or campground and come across unattended food on a picnic table. More times than not the owner returns within five minutes. I politely ask them to next time please clean up their food before they leave, even if for just a few minutes to use the bathroom or move their car. A bear could quickly get their food, which is nearly as bad as actually feeding a bear! Take every scrap of food with you! 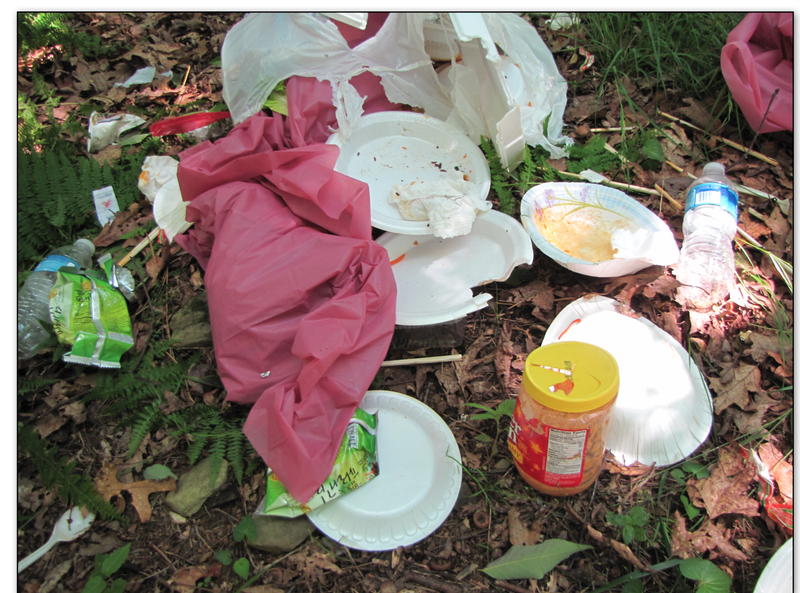 It is VERY important when recreating in bear country to leave all picnic sites, campsites, and backcountry sites clean — pack up all of your trash and ALL your food scraps and immediately dispose of them in bear-proof dumpsters or trash cans. Countless times each year I walk through picnic areas and campgrounds and find food scraps left under a picnic table or in a fire pit. Generally they are biodegradable ­­— watermelon rinds, corn husks, pieces of fruit, etc. — and I’m sure people think “it will biodegrade, it is not an issue,” but it IS an issue in bear country! Be sure to triple-check your site before you leave and take EVERYTHING with you. When hiking in the woods I encounter dozens of people each year who ask me if it is okay to run from a bear. NO! NOT AT ALL! Running from a bear could provoke the bear’s predator instinct and it may give chase which would result in officials naming the bear “dangerous” and possibly euthanizing it. Know what to do if you encounter a bear while hiking! Spotting a Black Bear in the wild is a special treat for anyone. The first thing I always remember when hiking in bear country is that I am in their home, not mine. Black Bears are very tolerant of humans and usually happy to share their home, but only if we respect them! Keeping your distance and not surprising a bear are a few important things to remember. Always remain 50 yards away from Black Bears and if you spot one and you are closer than 50 yards, back away slowly. Again, NEVER run! ​Stay calm and remember bears generally want to avoid human encounters.Identify yourself to the bear by speaking gently or clapping your hands to let it know that you are there. Sometimes a bear will stand on its hind legs to get a better look as it tries to identify you as a human. A standing bear is usually curious and not threatening. They usually just want to be left alone. ​When possible hike with a friend. Make yourself look as large as possible. If you are hiking with others gather together as a larger group will be more intimidating to a bear. DO NOT drop your pack! Dropping your pack will only reward the bear and potentially cause problems for other hikers. If the bear is not moving towards you leave the area and take a detour around the bear if needed. Remember to always give the bear an escape route. Slowly step sideways and back to move away from the bear. This will allow you to see where you are going and avoid tripping as you go. DO NOT RUN! If the bear follows you stop and hold your ground. Remember bears can run up to 30 miles an hour and they are expert tree climbers. Black Bears are very intelligent animals (in fact they are the most intelligent non-human land mammals in North America) and they communicate with each other and also with us. If you understand bear language you will be able to appropriately react when a bear starts talking to you! :) Bears will most often communicate with you when they are upset with you and want you to leave their territory. “Huffing” (a blowing sound) expresses their first level of agitation and is often followed by the second level of agitation which is “popping jaws” (when bears actively clack their teeth repeatedly). If a bear performs either one of these communications it is recommended that you leave immediately, even if you are more than 50 yards away. Again, back away slowly but do not run! The third level of agitation is a lunge. This occurs when a bear suddenly advances a short distance while huffing or popping its jaws. This may include jumping up on the side of a tree or swatting the ground. Again, leave immediately by backing away slowly. The fourth and rarest level of communication and agitation is a “bluff charge.” No matter how hard it may be, DO NOT RUN during a bluff charge. KNOW WHAT TO DO IF YOU ENCOUNTER A BEAR ALONG THE ROADSIDE! ​Bears and dogs do not mix! Always comply with regulations regarding where, when, and how dogs are allowed. NEVER hike in bear country with an unleashed dog! If you live in bear country it is recommended that you put your trash out the morning of pickup, not the night before. 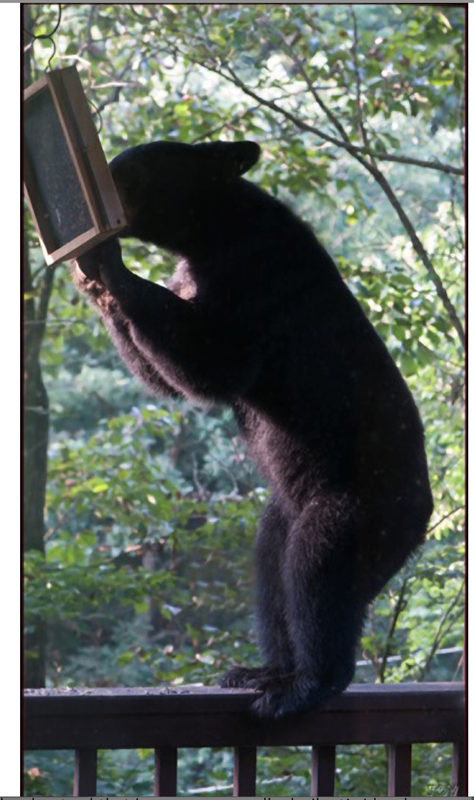 Black Bears are active at night and a bear could easily get into your trash which could put it in danger. Once it becomes habituated to human food & trash and is labeled a “problem bear,” wildlife officials will have to remove or euthanize it. During the week be sure to store your trash cans in a shed or garage where they are not easily accessed by bears. Feeding birds is an awesome way to enjoy wildlife in your own backyard, however if you also live in bear country it is best to take your feeders down in the spring time when the birds natural food sources become more readily available. This will help you avoid unwelcome visitors to your feeders. Cooking outside on a grill is a wonderful way to enjoy the outdoors, however if you live in bear country be sure to clean your grill or it may attract unwelcome visitors to your patio or porch. If you feed your pets outside their food may attract a nearby bear. Consider bringing your pet food bowls inside after they eat. I hope that after visiting my website and reading my books that every reader will understand that bears are generally docile, timid and extremely misunderstood animals. The more that we as bear advocates spread the word and make people realize that they are not the dangerous monsters that the media makes them out to be, the more people will join us in helping to protect them.